Blogger: Campaign Managers for the kākā: ZEALANDIA ecosanctuary and Forest & Bird’s Conservation Advocate Nic Vallance. Kākā are making a comeback and the world is a better place for it. You just can’t stay grumpy when you’re watching a bunch of them playing in the trees. Go on, try it. Good looking, smart, great sense of humour, enjoys a boisterous time but also very gentle and affectionate too. Kākā even weed out the non-native plant species from exotic gardens – what more could you ask for? So spend some time with a playful forest parrot as soon as you can and better yet: Vote kaka! Why vote for a kaka when you can vote for a kea. Like a kaka only better. Better??? ?…….the only fruit that a comment like that can bear……resembles mushrooms. The Kea get more publicity (good or bad) than almost any other bird in this fair land. The Natural History Film Unit made the Kea a little more iconic….so as far as “better” goes….they do get better advertising. Sirrocco flys the flag loud and proud for Kakapo…and with their recovery program making slow but certain headway….your vote is not needed in that direction either. The “selective” logging of “over-mature” trees, competitive exclusion from wasps in Beech forest…then the stoat explosions in mast years, the competition from browsing mammals and possums for the high-energy foods…all stack the odds further against the kaka than Kea or Kakapo. A vote for Kaka is a wise, informed, valuable choice….and maybe the catalyst to it’s adoption as an iconic brand…..or even a corporate sponsored recovery program. 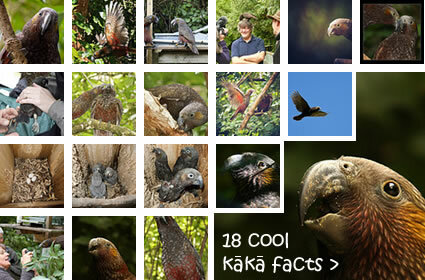 It’s the International Year of Forests and the kaka is our forest parrot -> perfect fit.